We just wanted to say thank you so much for allowing us to be owned by your gorgeous boy Hamish. From the first point of contact we found you to be professional and knowledgeable and allowed us to ask numerous questions. 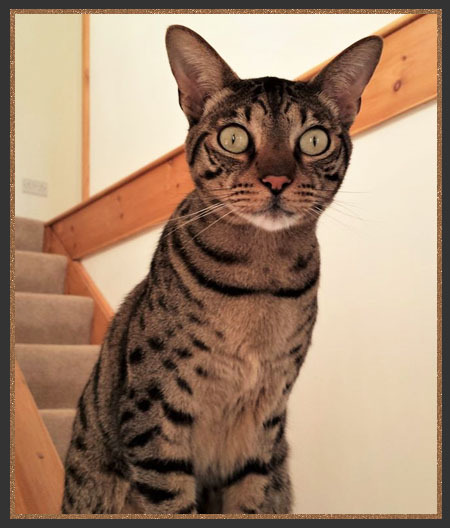 We have wanted a high generation Savannah for a while and fell in love with Hamish as soon as we saw his photograph, he is stunning. We found you to be very honest an upfront about the cost, potential behaviours and the amount of attention that Hamish requires. When we came to visit we didn't feel pressured or pushed into agreeing to take him home (but to be honest the decision was already made) and we felt you gave us plenty of time with him before agreeing. Since Hamish has come home there has never been a dull moment. He has settled well with our other cats and our dogs, although he is a little too curious about the tortoises. He can open doors and loves to help himself to packets of treats, carrying them to me when he wants me to open them. He also has a habit of putting my laptop into flight mode without telling me then sitting back while I shout at the screen as to why I can't get Internet! He has converted our other cats to raw and they are very happy with that. He loves to sleep in our bed. Well when I say sleep, we have a routine first that can last around 40 minutes. This includes head butts, licks and love bites while climbing all over me before settling on my head or my chest. This is to be repeated around 4 am. He is the most loving boy and we cannot imagine our lives without him. We are so grateful for your continued support and that we can still contact you for advice or to just pass on something else that he has done that has made us laugh. 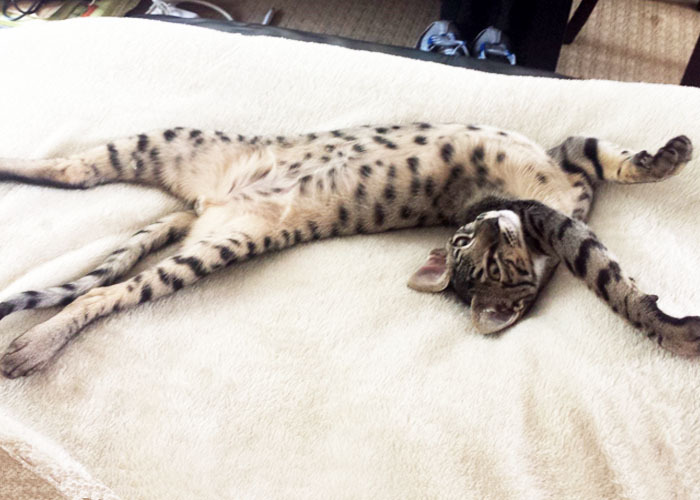 If anyone is looking to be owned by a Savannah, we would highly recommend coming to you as a breeder. Thank you once again and a happy new year. I just wanted you to know how much I appreciate your kindness and honesty when purchasing Dennis; your business ethic is impeccable. It was clearly evident from the outset that your priority is the welfare and happiness of your beloved cats. The fact that you are so thorough in your checks of potential buyers simply confirms this. You are to be commended as a breeder, I have no hesitation in recommending you to anyone seeking a beautiful cat. Dennis has brought me so much pleasure already, he is so loving, my perfect companion. We would just like to explain how pleased we are with Anya. It has taken me around three years of research to find someone in the UK who we felt would be able to provide a healthy Savannah and we couldn’t be happier with the decision to take Anya from you. She is the most well adjusted, perfectly house trained and gorgeous cat of any description we have had the good fortune to come across. She has such a lovely loving temperament without any little idiosyncracies that might have resulted in her becoming stressed in a new environment. In fact she has taken it all in her stride and is now a thoroughly loved and integrated member of the house, bringing an incredible sense of fun and lots of laughter with her antics and inquisitive nature. The help, advice and discussions we had with you made things much easier to get Anya home and settled and all the help once we had her home was greatly appreciated. As indeed was the massive pack of food, toys and information that you provided and which was completely unexpected. Those that are looking to take on the whirlwind that is a Savannah they really could not do better than to get in touch with you. Thanks again, if anyone would like to speak to me directly I’d be more than happy to explain how well things have been with our dealings with you. We have decided to name Mysterious Mose; TJ. He is growing up into amazing boy and I can't believe how big he is already. We would just like to thank you for a wonderful little kitten. He has got to be the best birthday present I could have ever had. He settled in straight away and would not leave our sides. Every morning he wakes me up by nibbling my nose or licking my face. He sleeps with me most nights.. well I try to sleep, where as he already beats me to the bed, stretched out on my pillow. He is extremely mischievous and loves climbing and scratching the walls, instead of using his scratching post. He's very cheeky. He also likes to play with things he shouldn't, such as plugs or chewing up paper. It's hard to be stern with such a cute face. He loves to stretch out on either of our laps after a long play with his new toys, that we can not resist buying. 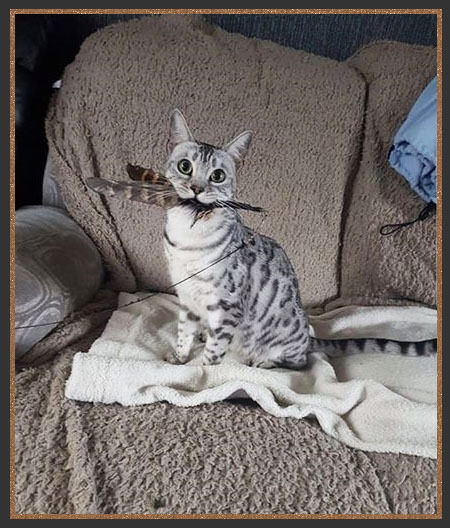 His favourite is a stick with feathers on the end, as soon as I pick it up he leaps and jumps astonishing heights to catch it. Throughout the day he has mad moments and runs around the house as fast as he can. I don't know how such a little cat can have so much energy, probably cause the rest of the day he sleeps so much. He is such a special cat and has a loving personality, we love him so much. I would like to say thank you for paperwork that helped us so much with his feeding times and what to do when he can get ill and also for the toys and food, it made it so much easier. Finally, You have done an amazing job breeding such magnificent breeds of cats. We will definitely keep you up to date and if we ever want another cat, we will not hesitate to call. Wish you all the best. 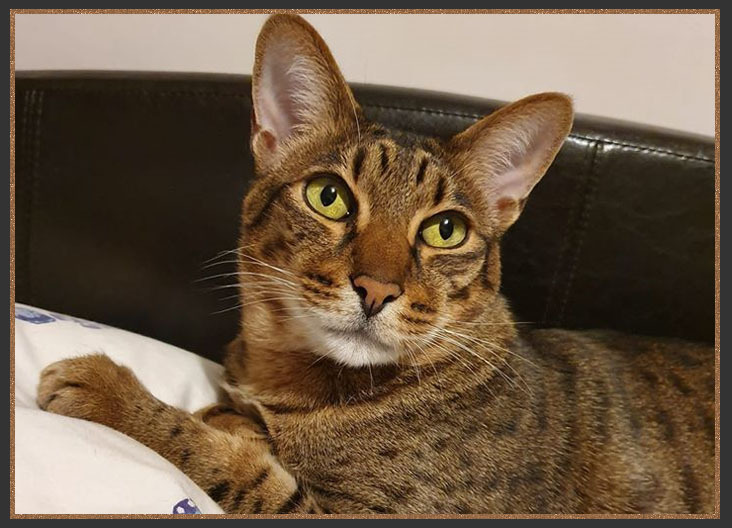 After losing my Bengal Charlie, I started an immediate search for a replacement to ease the pain and start a new life with another feline chum. 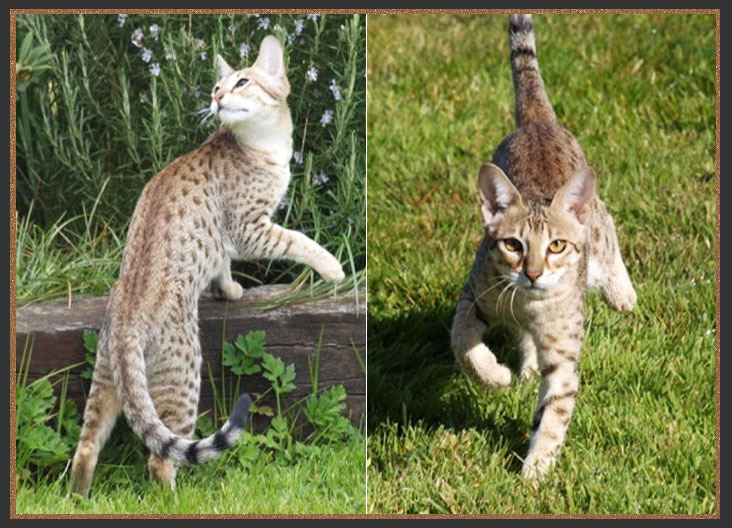 I researched a great many breeder sites dealing with Bengal and Savannah cats and contacted quite a few regarding available kittens but found very mixed responses. Some seemed over-keen, (if that makes any sense), and some were pretty indifferent, which put my back up straight away. Others showed their cats like they were for sale on a supermarket shelf. When I came across Rachel's site I was immediately struck by how fit and happy the kittens looked, and the environment looked clean and homely too, so I got in touch. The responses to my emails were not only swift and informative, but were warm and comforting, clearly showing a loyalty to her cats and deep concern for their placement. I also checked out the Sitting Pretty Facebook page, which only gave me more confidence in Rachel and her cats. Stanley was available so there was no doubt who I was going to have. My confidence in Rachel was that high that I paid the asking price the next day without seeing Stanley beforehand, and that belief was well placed as every necessary action and more were carried out by Rachel, including the delivery service. When the wee man arrived he was in perfect condition and within 24 hours was eating from my hand with the confidence of a well brought up kitten. To this day he has had no accidents in the toilet department, using his litter from opening the cat carrier. It was obvious from seeing him that he was well loved and well trained too. As promised all vaccinations were done, along with micro-chip, worming and flea treatments, and the paperwork regarding his bloodline was extensive. And the wee blue cat carrier was a cool addition. Within 48 hours he was pretty much all over the house and within 72 hours was using the cat flap to the conservatory. As he continues to grow, and eat me out of house and home, his personality is coming more to the fore, and what a great personality it is too. He spends a lot of time up on my shoulders and is quite happy curled up on my chest sleeping. Sure he has manic moments but he is a cat with no mental scarring and is afraid of nothing. He is even extremely sociable with visiting friends and will even sit on my neighbours shoulders, when other cats would be well wary. Rachel is keen to keep in touch with her customers and often inquires after Mr Stan, again, another sign that she cares about her breeds and that this is more than just a business to her. Hopefully I shouldn't have the need to search for another cat for quite some time now, however, if the worst should happen, then I am confident there is only one place I would go, straight back to Rachel. So many thanks for a pain free and very friendly experience, I am certainly reaping the rewards of choosing Stan. After a lot of research and debating on what kitten breed to add to our fur family, I was put in touch with Rachel. She sent me to her website and was incredibly helpful in choosing a kitten and telling me more about the breed. We settled on Prince!! Whilst we were waiting for him to be neutered (all arranged and sorted by Rachel) we were sent lots of photo updates on his progress and kept up to date on the courier. The day Prince arrived he was fairly grumpy, but who wouldn't be after spending 8 hours in a van and then put into a strangers house!! He wasn't too keen on the others cats and was definitely not a fan of the dogs!! However he took to me and Lewis and instantly he wouldn't leave us alone, he wanted loving and fussing. After 24 hours you could see a small change in his attitude towards the others. he wasn't so grumpy but still a little cautious. But the day after he was a completely different kitten, he was rubbing against the dogs and playing with the other cats, he had completely changed. Dealing with Rachel was so easy and she explained every detail to us. She has been so supportive and a real pleasure to have dealt with her. Prince is a remarkable boy and is an absolute stunner, everyone who see's him comments on his looks. 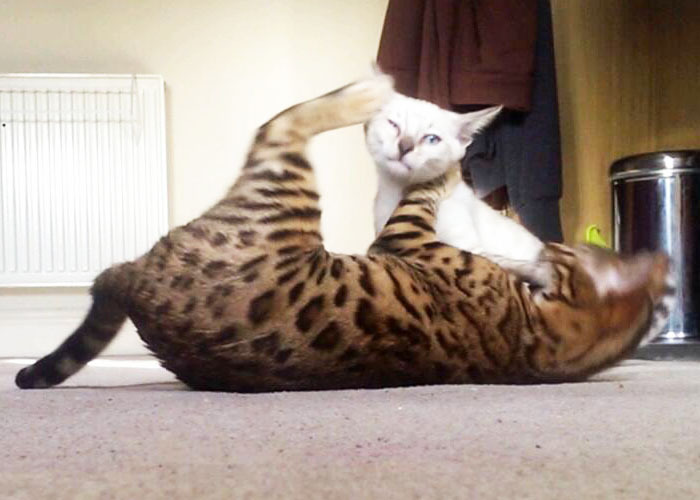 I would definitely recommend Sittingprretty to anyone looking at Savannahs or Bengal's. If I was to ever want another myself, I wouldn't hesitate to return to Rachel. Firstly myself and my family would like to thank you. From the moment we enquired to the visit to your home, this is not a business. All the effort you clearly put into your cats / kittens shows in the confident little ‘fur balls’ that rule your house. It's a love affair I haven’t seen in other breeders. You and your husband made us feel welcome, even my kids relaxed in your home. When I asked to see Magic Trick – aka Olly's parents, you didn’t hesitate and you answered all my questions and concerns. Out of interest I wanted to see the ‘celebrities’ from your website. Yet again I was shown all including the latest arrivals. As before, the time and effort you put into your cattery is breath taking. I finally met 'Dennis The Menace' - Olly’s father. You did warn me about the head wash I would receive and he didn’t disappoint. When he finally retires, I want him! We left your home knowing the decision to come to you was perfect and Olly would be coming home with us soon. You kept us informed of his progress and answered all my emails promptly. When we collected him, as before, relaxed and no pushy ‘you’ve paid, he’s yours.. bye’, you took your time. The kitten package was more than expected, I wish I hadn’t bought the toy selection etc we did.. Olly didn’t know where to look. When we finally got him home, he settled within minutes. I don’t know if he had seen stairs before but they became his play ground. I wasn’t expecting a lap cat but again you've clearly spend the time with each kitten. He was head butting all – a very happy, confident kitten. At night we now have a new edition… he doesn’t sleep at the end of the bed.. nope he wants to be in the duvet, head on pillow. And he is developing the ‘head wash’ his dad does…. Finally if anyone is considering buying a kitten from Sittingpretty, you will not be disappointed. I wish all breeders followed your standards. We wish you all the best, I will keep you updated and If I ever want another kitten, you will be my first call. We were thinking of adding to our family a Savannah for some time. Browsing online we found Rachel's lovely website and came across Chopper (now Freddie) and our hearts melted with his lovely funny face and good looks! Truly love at first sight! We contacted Rachel who answered every question we had and in turn she gained some reassurance that we were suitable for Chopper. We were unable to visit or collect him but Rachel enabled him to be safely brought to us by a nice man named Pete. Throughout Rachel has advised us and enabled fabulous support. We have four other cats; two Ragdolls and two Bengals and can honestly say Rachel's support had been second to none. Chopper arrived, fit and healthy and on a mission to melt every heart and settle in with our other furry family members. He has such character, loves cuddles and curling up on our laps, he eats well and loves the running wheel we have bought. We love seeing him grow almost daily and follow his hilarious antics he has a habit of collecting small items and hiding them. He has a lovely unique personality! Thank you Rachel. We just wanted to say thank you very much for allowing us to have two of your kittens. Tyson and Naomi are settling in well. Tyson is currious and into everything. He sleeps with us on the bed for part of the night and then goes back to his sister. Naomi is still a little timid (though we had discussed this and thats why we have two kittens) but each day she gets a little more trusting. With a little patience and help from 'Scaredy cat', we can pet her now and she comes looking for petting. They are both great fun and have thier own personalities and are giving us great pleasure every day. 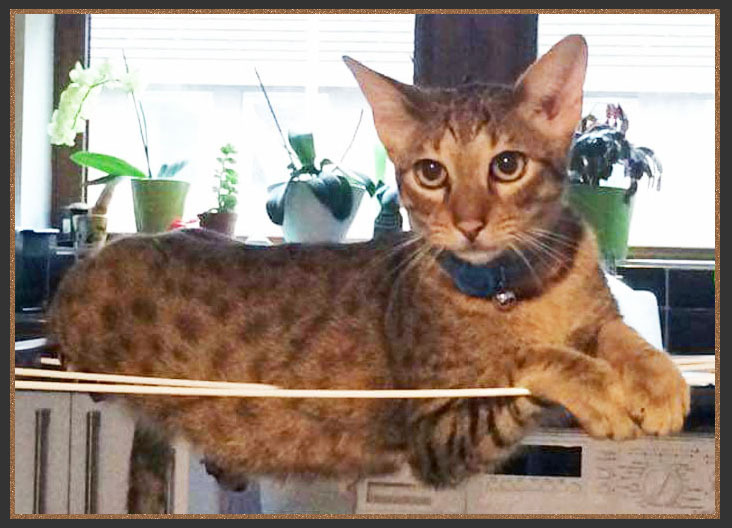 I went looking for a friend for my boisterous Bengal boy, finding Rachel Hartley of Sittingpretty Cats. 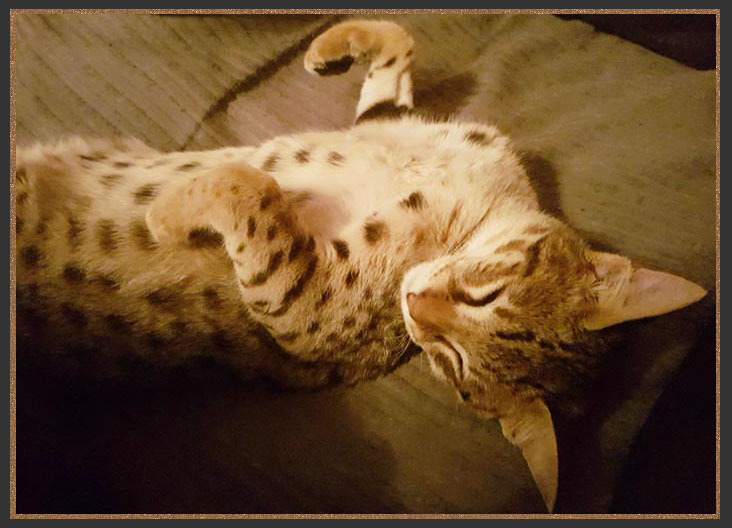 I decided to purchase a Savannah kitten. The kitten I chose is now named Merlin. 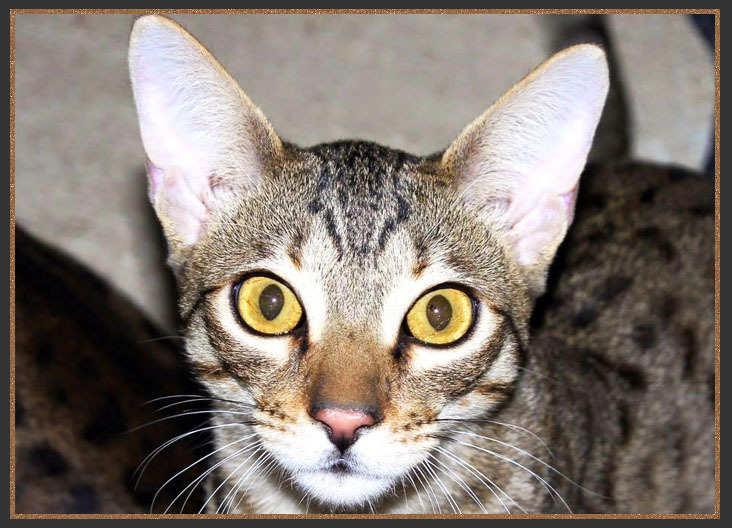 He came from a scrupulously clean and very well kept cattery with a full health guarantee. Rachel is knowledgable about both of her breeds of cats and offers a friendly lifetime of support and advice for your kitten. If purchasing another kitten I would certainly return here. Merlin is of a good breed standard with a superb friendly nature and temperament with quality for breed or show. I would recommend Sitting Pretty Cats without hesitation. 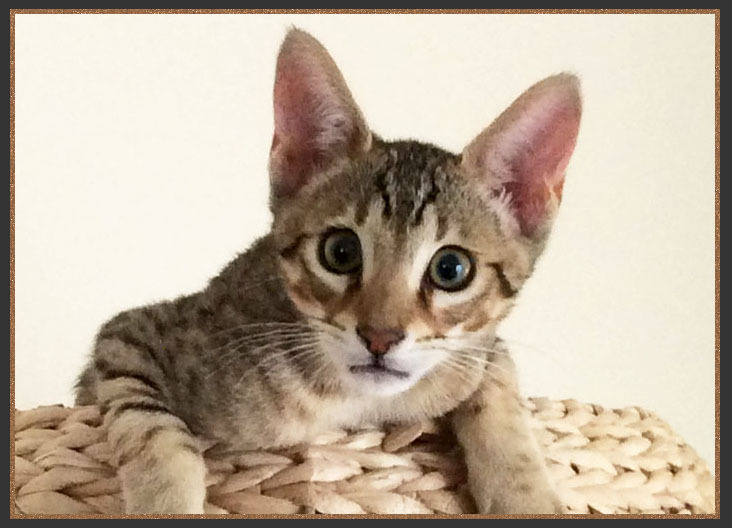 I have found Rachel's website while browsing for Savannah kittens and it's professional design and essential information about cats caught my attention. Having bad experience with online scammers, I instantly knew I am in the right place. Never mind her busy schedule (and mine) Rachel found some time for me and my daughter to come over and spend time with her cats and answered our questions. Our cat-Tom was hiding well during our visit but we liked him anyway. Took him few days to settle down in the new place but it was worth waiting. Rachel prepared all paper work and neutered Tom before arrival. Provided samples of food, toys and supporting information how to look after kittens in their first days. Stayed in touch answering my questions via emails and that made things much easier. All in all a great experience. I highly recommend Rachel if you are looking for pedigree cat or kitten. You will not be disappointed. A lovely and professional breeder. Very friendly, communication is top notch. Rachel provides all the information one would expect to get from a professional breeder. She even offers ongoing support afterwards in case of any queries. Very happy we picked her. 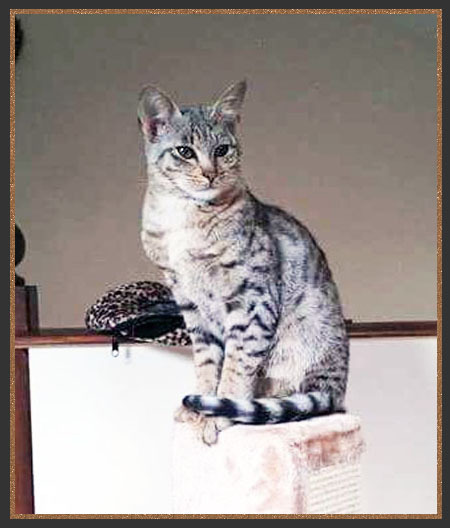 Scarlett has a very very lovely character and is a majestic looking Savannah. 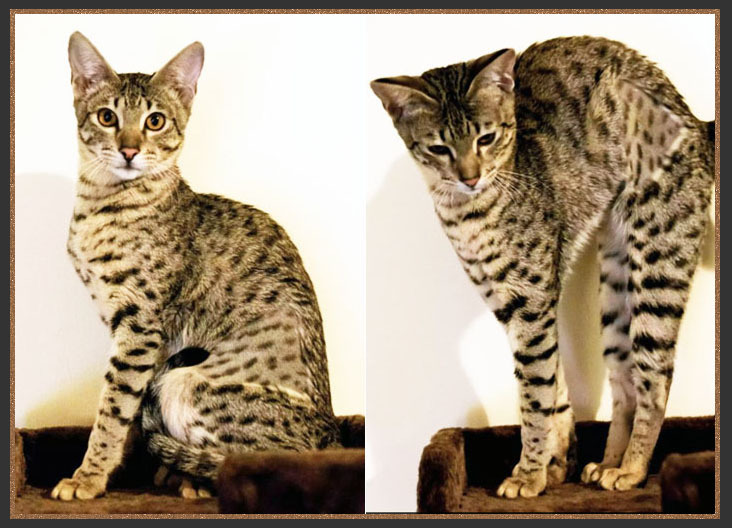 After deciding that a Bengal was the cat for me, I spent months looking at different websites and I found Sittingpretty Cats. The website has very good information, is easy to use and well set out. After reading Rachels website, I came across Sittingpretty Cuckoo and knew he was the cat for me; everything I was looking for and at a reasonable price. I have never been to a breeder before but from the moment I made my enquiry, I knew I had made the right decision. Rachel is friendly and answers your emails quickly. After viewing Cuckoo you could see that everything Rachel had written on her website was true, so I paid in full. Rachel kept me updated on his progress and sent me photos until it was time to pick him up. Cuckoo who is called Makulu now is a stunning kitten. His markings are amazing and his fur is so soft. Everybody who sees him loves him, especially my niece and nephew. He fitted in so quickly with my other moggie cat but I felt he needed someone his own age. So I decided to look at getting a Savannah and in the the end I got Sittingpretty Louis, now Shango. I am so glad I did because the two of them are like brothers. Makulu likes to play and run around Shango is more the cheeky cute one who loves being around people where he can get stroked. If you are looking for a very friendly socialized kitten you wont go wrong with Rachel. I love my two mad cats. When looking for our recent additions we came across Rachel who from the very beginning acted in a very professional and knowledgeable manner. At first we were a little uncertain to which breed would best suit us but Rachel was more than happy to give us plenty of information and made us feel relaxed when visiting the kittens. In the end we liked both breeds as they both have their own quirky characteristics. 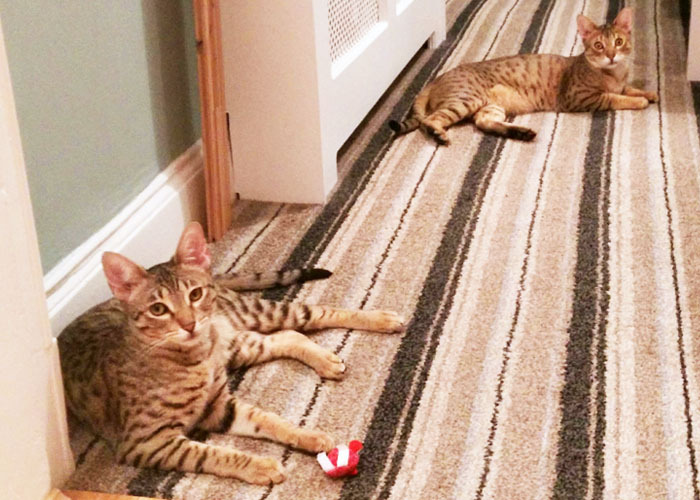 Both Foxy (Bengal) and Rory (Savannah) settled in to their new home really quickly and both are growing up to be amazing cats. We cannot thank Rachel enough for the help and support that she gave us throughout the process and would recommend anyone looking for a feline pet to get in touch with Rachel. Three weeks ago we became the proud owners of Sittingpretty Stargazer, or Cosmo for short. 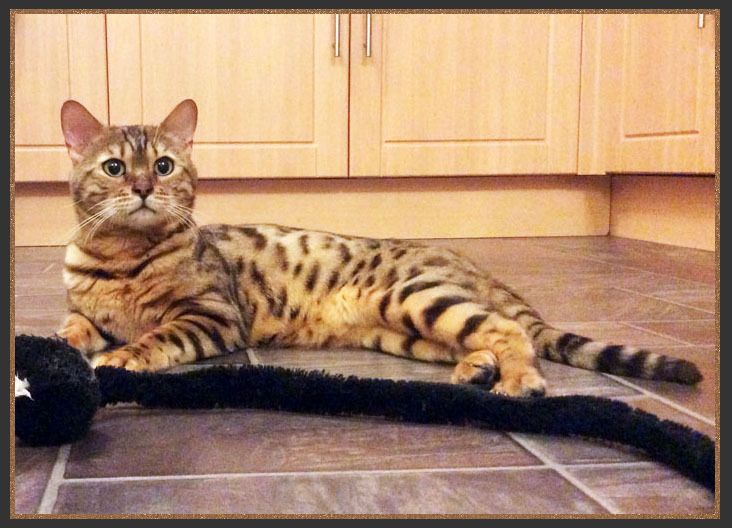 We are completely in love with our silver Bengal bred by Rachel. From when he became available until the day we picked him up (and even now), Rachel has answered all our questions and sent us regular pictures and videos. We live a long way away and had a very short time frame to be able to pick him up due to boat times but Rachel let us visit the night before and sort all the paperwork so we wouldn't be delayed on pick up day. She spent a lot of time with us when I know she was extremely busy with other kittens to show us her cats and let us bond with Cosmo. He is such a good natured sweet cat and is full of love and loyalty we are so happy with the addition to our family. We would whole heartedly recommend Rachel to anyone looking to purchase a kitten, it's very clear she loves her kittens and this is reflected in their good nature, beautiful coats and general wellbeing. I would like to start by saying thank you to Rachel for breeding the most stunning kitten, looks and personality. Dodger has settled in so well in our home with my other two boys. He's such a character!! Also I would like to thank Rachel for being so easily contactable and always sending updated pictures and videos until he was old enough to come home with me. Rachel is so knowledgable as a breeder and cat owner and has and even still gives me any information requested from me. The set up at Rachel's cattery is so well done and so clean and we were also made to feel very welcome. I would always recommend Rachel as a breeder and in fact, if I ever wanted any more kittens I would go to Rachel again and again even if it is a four hour drive from me!! It's clear when you visit that each and every cat is looked after so well and loved by you!! Firstly I would like to thank you for giving us the opportunity to have Storm as part of our family. 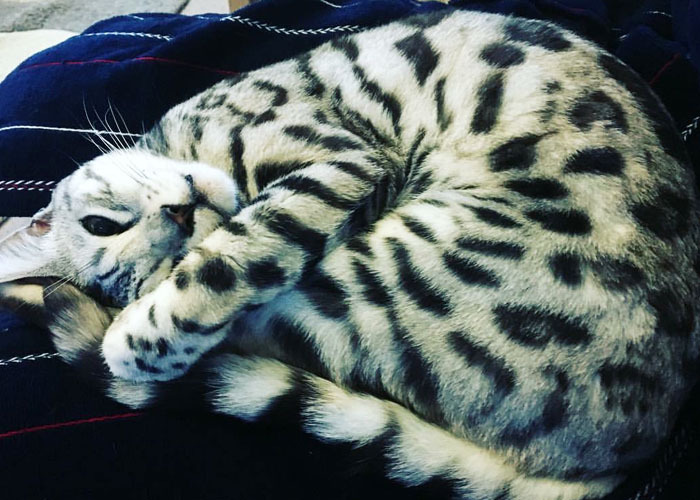 When we decided that we wanted a Bengal cat, I looked on the Internet and found numerous web sites, then I came across yours. After looking through it I saw Storm. He was perfect for what we were looking for. Being a bit dubious because I have never been to a breeder before, I decided to enquire about him. Your reply came back quickly and from that moment I knew I had made the right decision. You made me feel at ease and it was obvious by the way you spoke that everything you have put on your web site is true. You really do have a passion for your cats and you do care about them. You kept us informed about him right up to the day we came to view him and since the day I brought him home you have kept in touch. You have been there when I asked for advice when I was worried about him and I know I can always ask you for advice if I need it in the future. Storm seems happy with us and I wouldn't like to be without him now and its all thanks to you. Thank you once again Rachel. Firstly I'd like to say how wonderful I thought your website was, it had all the information I wanted and gave me a great first impression. It was obvious from then that you cared a lot about your cats and the homes they would go to. I was amazed how quickly and kindly you responded to my initial enquiry about 'Etch' now known as WiFi. You offered me all the information I requested and put me at ease straight away. It was so refreshing to meet someone who wanted to check up on me and make sure I was right. I'd done my research and knew that a Bengal was for me. So I reserved WiFi and came to collect him within a few days. I was met with a lovely friendly welcome and was amazed with the set up you had for your kittens. It was clear to see the love, care and attention you give everyone of your babies. Soon after bringing WiFi home you were there every step of the way to help me with advice day and night! I can honestly say I have learnt such a lot from you. You have always been keen to keep in touch and find out how the boys are doing, despite having your hands full. It is clear you have a real passion and dedication towards your cats! WiFi quickly became part of the family but I felt he needed a friend. I contacted you and you helped me to find Pixel. He arrived just before Christmas and settled in so quickly. The boys have completely opposite personalities but their temperament is wonderful. I have a young daughter and the boys are fab with her. I honestly can't remember what life was like without them, they provide love, affection and hours of entertainment. I only wish I could have more! I would just like to thank you for allowing me the opportunity to own my two beautiful boys. The really have brought an awful lot of joy to our house... Along with a lot of toys, and cat trees!! We cannot recommend Rachel and SittingPretty Cats highly enough. 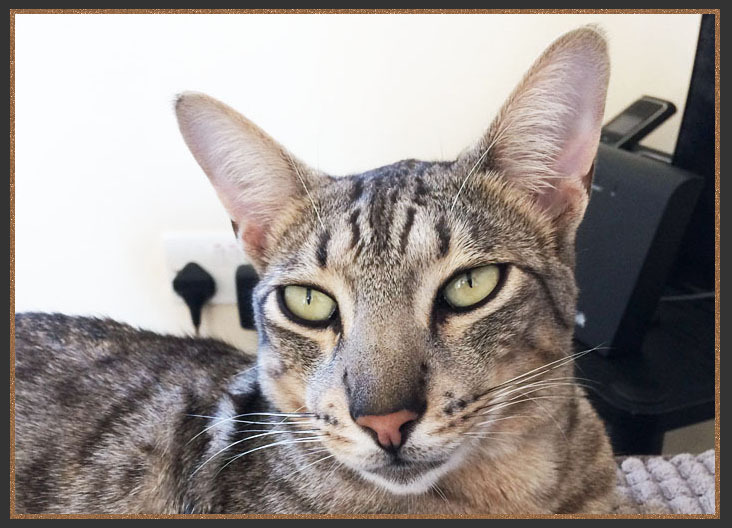 From making an enquiry about our Bengal kittens to collecting our beautiful Sittingpretty Batman (Albi) and Sittingpretty Robin (Bailey) she was very knowledgable, helpful and professional. 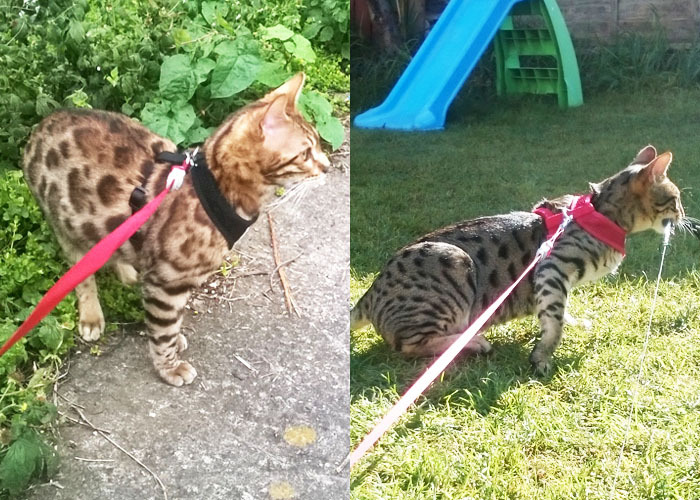 Our two boys are settling in and are an absolute joy, which is a reflection in itself as to Sittingpretty's dedication and work into breeding top class Bengals.